The Creation that we see around us is a reflection of the super-world that controls and directs all that happens here, the world of ether. Everything that exists here, the way it looks, the way it functions, is as per a code or pattern, not even a spec of dirt is ‘just like that’. It is this code that makes the trees green and earth brown, that causes water to fall and fire to rise, that decides the size and shape of the body you are in, to the extent of the distance between your eyes and gap between your fingers! Every shape, every colour, every sound, every texture can be expressed in the realm of ether using these codes. Our ancestors were masters of the underlying codes of Creation, and used their design to communicate with the energy world. They were not primitive or superstitious, they were scientists – their sciences being accessible only to a limited few in the present times and the majority, unable to comprehend them, tend to overlook the sheer genius behind them. Take for example the pyramids. We have all grown up marveling at the pyramid of Giza as one the Seven Wonders of the World, but how many thought about what makes it so wondrous or why our ancients chose to construct that specific shape and form only? Did you know that the pyramid of Giza has its sides aligned to the four cardinal directions and to the belt of Orion and Sirius? Did you know that when viewed from the top, it actually has eight faces (not four) which can be seen only at the dawn and dusk on an equinox? 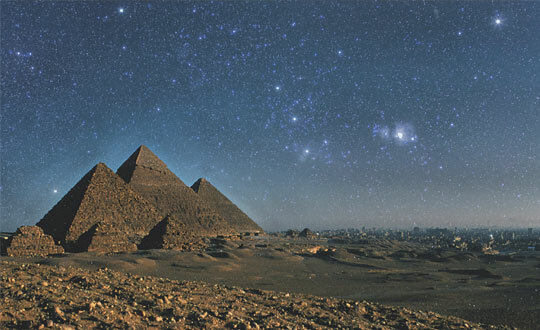 Did you know that the shaft in the pyramid point and align towards the Orion? All this reveals the sophisticated knowledge and understanding of the solar cycle, stars and constellations and mathematics as possessed by the architects of the pyramid. In fact, not just the great pyramid of Giza, but even the Pyramids of sun and moon at Teotihuacan, Mexico have been mapped according to the belt of Orion, the pyramids at Bosnia are aligned to north-south direction. Pyramids across the world including the Gebel Barkal (north Sudan), Temple of Ur (SE Iraq), Kushan temples and temples in Tamil Nadu (India), and the hundreds of pyramids in Peru, Bolivia, Central America and those across the Indian Ocean share striking similarities leading one to believe that they are created out of the same knowledge of design, geometry and measurement derived from a common source. The Mayan and Egyptian legends hold that the instruction to build pyramids was passed down by gods to men. The Egyptian faith talks of Ptah, as the architect of the Universe, while the vedic scriptures mention the divine architect, Vishvakarma. So what was the purpose for this cohesive network of pyramids? Some call them as means to communicate with the other world, some others say they are power-spots. In fact the term pyramid itself is derived from the Greek words ‘pyra’ meaning fire and ‘midos’ meaning measures and there have been enough experiments that conclude that they are energy collectors and create powerful energy fields. Alexander Golod, who coordinated groups of scientists in Russia, carried out scientific studies for over a decade in fiberglass pyramids built in Moscow. The results showed significant positive effects for both biological and non-biological materials. Some of the results of his studies included the improved activity of immune system of organisms upon exposure to the pyramid (Scientific Research Institute, Mechnikov, Russian Academy of Medical Sciences), heightened medical properties and reduced side-effects of certain medicines (SRI of Virology, Ivanovskiy, Russian Academy of Medical Sciences) and detection of an energy column above the pyramids by the Russian military radar. WHAT IS SO SPECIAL ABOUT THE DIMENSIONS OF THE GREAT PYRAMID? It is possible from the dimensions of the Great Pyramid to derive the two most famous irrational numbers in mathematics. One is pi, and the other is phi or the ‘golden ratio’. In the Great Pyramid, the golden ratio is represented by the ratio of the length of the face (the slope height), inclined at an angle theta to the ground, to half the length of the side of the square base, equivalent to the secant of the angle theta. The value of pi can also be found in the dimensions of the Great Pyramid. If its height (1466 metres) is taken to be the radius of a circle, the perimeter of its base (4 x 230.4 = 921.6 metres) is almost equal to the circumference of that circle (2пr = 921.6 metres). The product of pi and the square root of phi is close to 4. The Shri Yantra diagram consists of nine interwoven isosceles triangles, four point upwards, representing Shakti and five point downwards, representing Shiva. The triangles are arranged in such a way that they produce 43 subsidiary triangles, at the centre of the smallest of which there is a big dot (known as the bindu). These smaller triangles are the abodes of different gods. In common with many depictions of the Shri Yantra, the one shown here has outer rings consisting of an eight-petalled lotus, enclosed by a sixteen-petalled lotus, girdled in turn by three circles, all enclosed in a square with four doors, one on each side. The square represents the boundaries within which the deities reside, protected from the chaos and disorder of the outside world.